Alaska Seafood Cooperative (AKSC) vessels operate in the Bering Sea, Aleutian Islands, and Gulf of Alaska throughout the year. Our vessels participate in multi-species fisheries, harvesting more than a dozen species of sole and flounders. These include include yellowfin sole, rock sole, rex sole, flathead sole, arrowtooth flounder and Alaska plaice. Additionally, AKSC vessels harvest Pacific cod, Atka mackerel, Pacific Ocean Perch, and several other species encountered in the rich waters off Alaska. AKSC catcher processors range in size from 107 to 296 feet. Catcher processors have equipment on board to remove the head and guts, and freeze products in block form. In most cases, fish are frozen within two hours of being removed from the sea, ensuring high quality, fresh product. The North Pacific Fishery Management Council (NPFMC) has adopted precautionary management principles and has limited combined groundfish harvest limits in the Bering Sea and Aleutian Islands to two million metric tons. 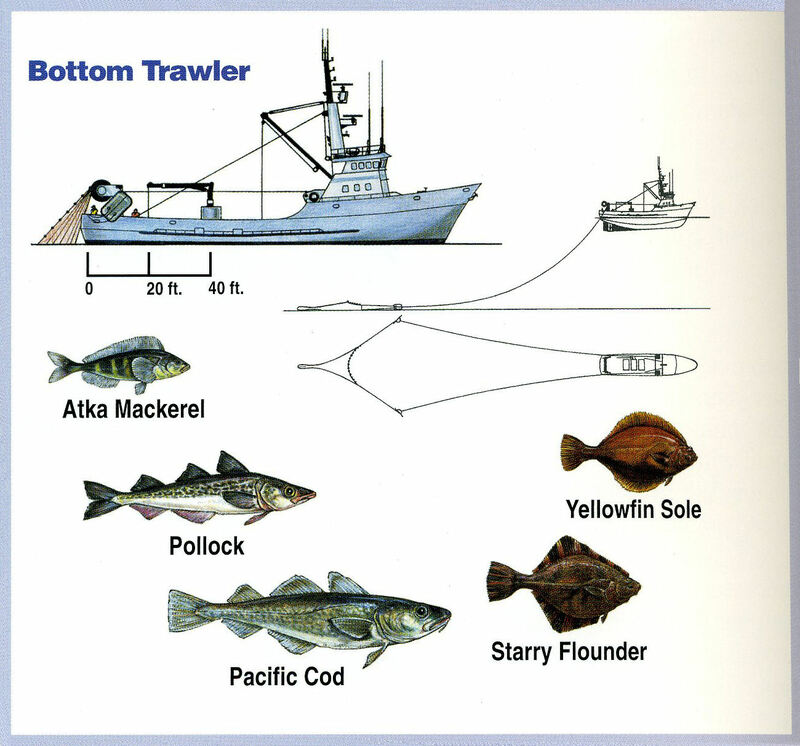 Typically, pollock harvest quotas are set between 1.3 and 1.5 million metric tons annually, and the remaining flatfish, cod, and other species make up the remainder. Additionally, annual limits are placed on halibut and crab. Bycatch reduction is a major goal of the NPFMC and the National Marine Fisheries Service (NMFS). To achieve bycatch reductions, the Council has adopted new incentives that remove the “race for fish”. Amendment 80 to the Bering Sea Fishery Management Plan allows flatfish vessels to form cooperatives (such as AKSC), and allocates yellowfin sole, flathead sole sole, rock sole, Pacific cod, Pacific ocean perch, and Atka mackerel. Additionally, crab and halibut quotas are allocated to each cooperative. Each cooperative is responsible for its own target catch and bycatch. Because of the multi-species nature of these fisheries, when any allocation is reached, the cooperative must stop fishing. This provides a strong incentive for cooperatives to keep bycatch rates low and reward those who fish cleanly and efficiently. Two federal observers placed aboard each vessel ensures accurate catch accounting, and collection of biological data for stock assessments. Additionally, a suite of monitoring tools which reduce bias and assist observers include motion-compensated flow scales, observer sample stations, and a handful of other technologies. This increased cost of monitoring is borne by the fleet. To further reduce halibut bycatch, AKSC has developed “halibut excluders”, which incorporate natural halibut behavior to allow them to swim free from the net. Because flatfish live close to or on the seabed, the Bering Sea Flatfish Trawl was developed by AKSC in collaboration with National Marine Fisheries Service scientists. Bering Sea Flatfish Gear incorporates the latest technology by raising trawl sweeps off the sea floor, reducing net size, and utilizing semi-pelagic trawl doors. This reduces benthic habitat effects by 90%, and reduces fuel consumption without reducing the gear’s ability to effectively harvest flatfish. Bering Sea Flatfish Gear was required for all flatfish fishing beginning in 2011. Additionally, the NPFMC has identified particularly sensitive and essential habitat for fish, marine mammals, and seabirds. Large areas in the Aleutian Islands and Bering Sea have been closed to reduce any habitat effects from fishing.